So we bought a condo and moved in a couple of weeks ago. But before we moved in, on the day that we officially closed, we stopped by our new place to take some photos before all of our stuff got piled into every nook and cranny. But let me tell you about the place first. 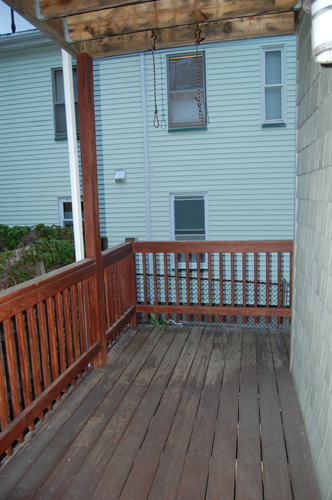 It's a small (826 square feet), 2-bedroom, 1-bathroom condo that is on the first floor of a double-decker. For all of you who don't live in the Boston area, double-decker means there are only two units in this condo association. The house is really old - records say it was built approximately in 1900, which is what usually goes into records when houses are so old that they were built before any record keeping. So it may even be older than that. With age come some issues, but also some really awesome features. We love the fact that our ceilings are 9 feet tall! 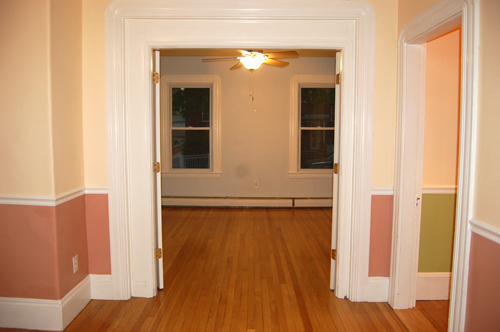 We also have some really awesome baseboards, chair rail, and trim around the doorways and windows. That is the hallway off the main entrance. I love that we have a coat closet. The chandelier is obviously outdated. Another thing to note is that in all of the rooms, we only have three light switches, 100% of which are poorly located. The rest of the lighting fixtures have pullcords. 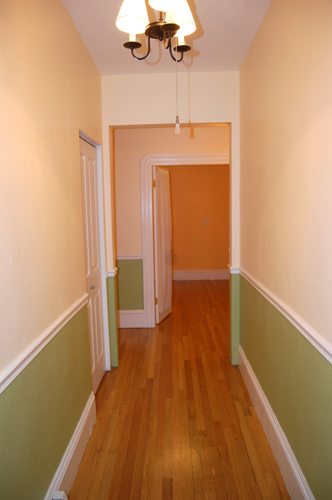 From the hallway, you can see into the smaller bedroom, which will eventually become the baby room. Off the hallway on the left is the bathroom. 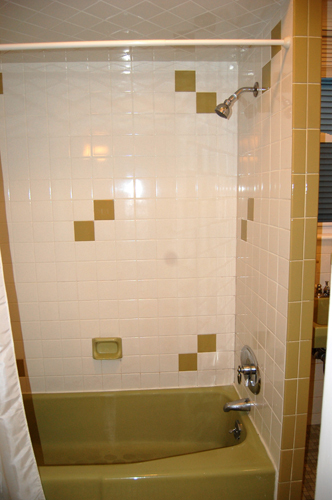 I hesitate to show you the bathroom so early on in this "house tour" because it is...well...hideous. Let's just say that it hasn't been updated since at least the 1970s. I suspect that is because it's difficult to renovate a bathroom when there is only one in the house. But I'll just let the photos speak for themselves. Behold, the avocado green bathtub surrounded by avocado green tile. But wait, there is more! We also have an avocado green sink! 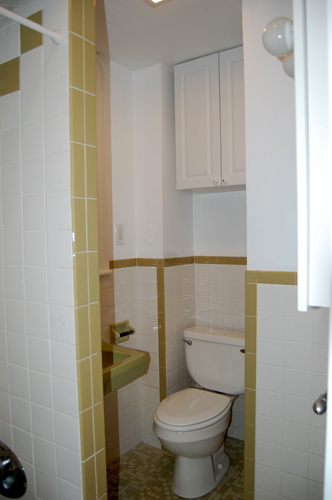 And even though it may not be obvious from this photo, the sink actually overlaps with the toilet. So in order to sit straight on the toilet, you have to slide under the sink. Can't wait till I'm doing this nine months pregnant. Oh, and also, the window is right over the sink, which means the mirror is to the left of it. I wonder who designed this lovely room. Anyway, enough about the bathroom (and yes, we plan to gut renovate it some day). Here is the baby room. 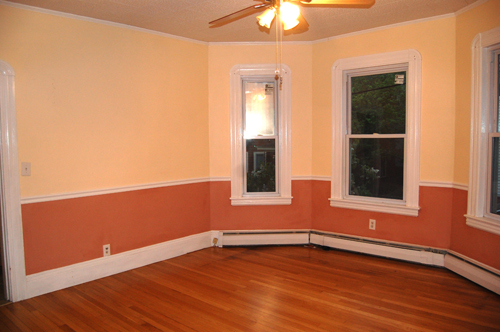 Although it's not obvious from the photo, it's actually been painted bright orange by the previous owners. 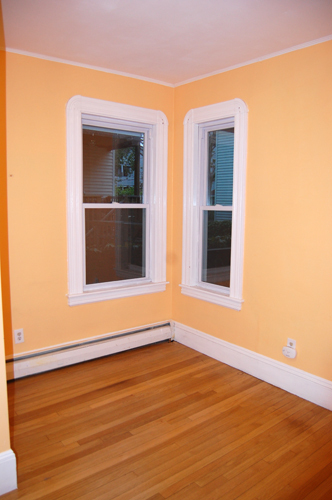 In fact, the color scheme in this house needs an update in general. The room is not big, but it's functional and has awesome french doors (both bedrooms do). The baby room has a small closet (it's not as deep as it looks because the toilet is right behind it). It also has a light that is completely off center. And the light switch is on the wall OPPOSITE the french doors. It makes no sense to me either. 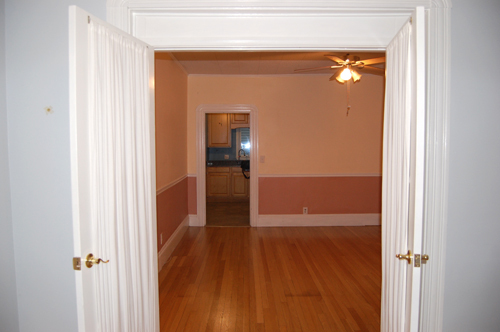 Actually, it does - this condo used to have only one bedroom, which was this room, except the room was bigger and had three entrances into it. So the light used to be centered, and the light switch used to be by one of the entrances. Our master bedroom used to be the living room, which means that what used to be the dining room became a living/dining room. 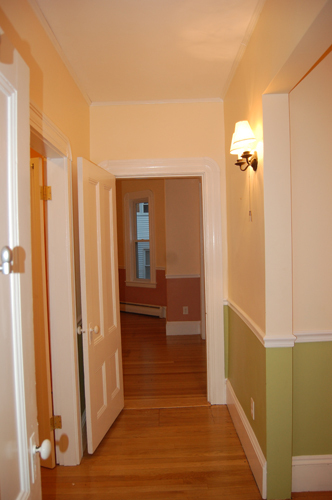 This small hallway connects the main hallway, the bathroom, the baby room (on the left) and the living/dining room. From the living room, you can see our master bedroom. Don't you love the pink/green contrast? I think that was fashionable with teenagers when I was in high school. Too bad I never caught on to that trend. 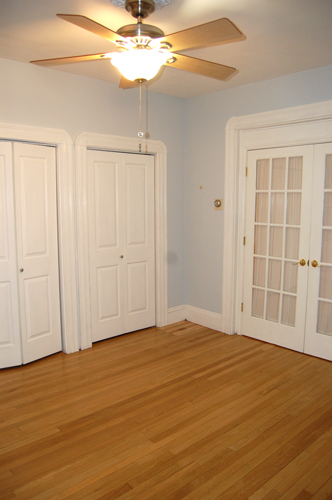 The bedroom is pretty large, has awesome french doors and a huge closet. The master bedroom, living room, and kitchen have ceiling fans, which are all different, but almost equally ugly. I may be biased - I don't like ceiling fans. But we are keeping them for now because we don't have A/C and summer is coming. From the bedroom, you can see the living room and straight into the kitchen. The living room has awesome bay windows. The kitchen is a combination of awesome and WTF. 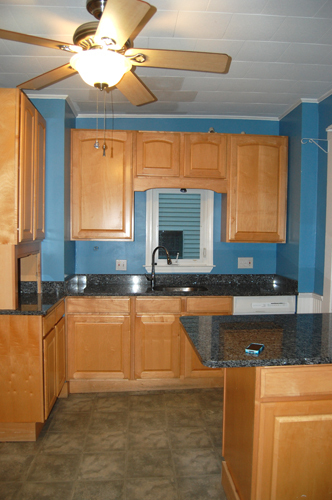 It was renovated about ten years ago, and features really cool blue-gray granite. 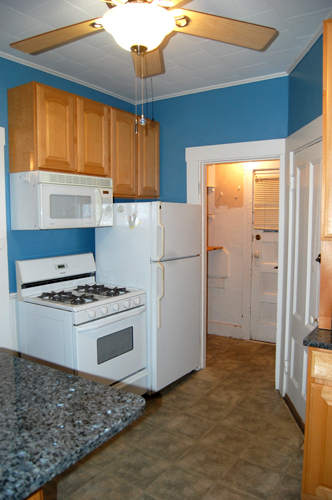 However, it is painfully obvious in this photo that the floor and ceiling are slanted (the cabinets are actually level). The floor has seen better days, and so have the appliances. Oh, also, there is a significant amount of mold in the cabinet under the sink (I think the bathroom and the mold are some of the reasons we were able to afford this place). 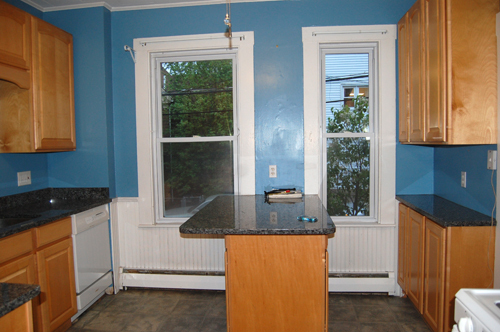 The kitchen does have three windows (including one over the sink), which I like. This is the other side of the kitchen. Unfortunately, there is zero counter space next to the stove. But, we do have a pantry, which is in dire need of a paint job. Through the pantry, you can see the door that leads to our porch. 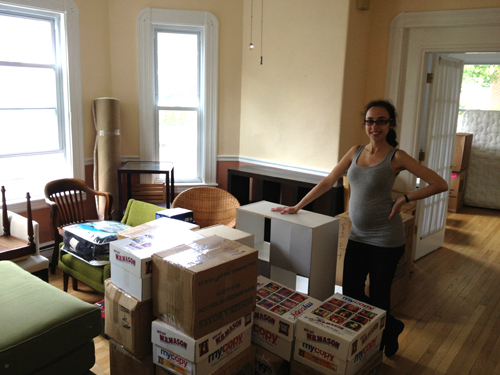 We are still working on unpacking those boxes. 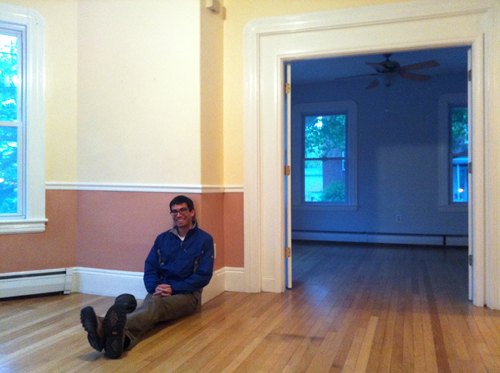 Meanwhile, we are making so many plans on how to update our new place! 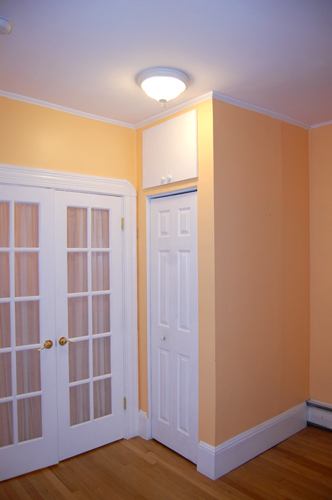 Painting, setting up the baby room, and gutting that bathroom down the road are all on our long to-do list. It's going to be an adventure! Oh what a lovely place. And I bet painting over that green/pink combo will be among the most satisfying things ever. Worth it right there. I'm happy when I see others settling into smaller condo type places with a kiddo in the works. We live in a 2dr/2bath place with no plans to move. I know baby stuff will take over a bit but we are determined to keep it under control. It seems that our apartments are similar (must have been the fashion of the day), we have the huge ceilings, a central highway that leads to a smaller room, the kitchen at the end and a living room coming from it. 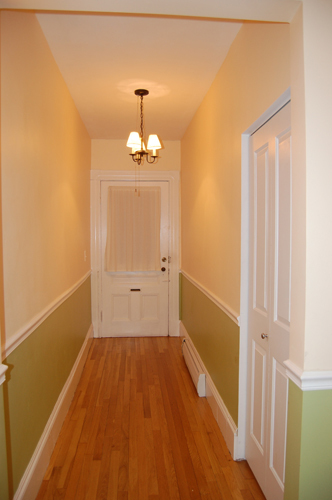 I have to say I kind of like the lime green on the hallway and the light blue on the master room (oops). Do you know Ainhoa's blog "a little bite of everything"?She has a lot of DIY projects and recently they re-did a bathroom with 80's tiles by painting them with some special product and the result was super good. I'll have to check out Ainhoa's blog, thanks for the link! I actually did look into painting the tiles, but it would be a stop-gap measure at best because there are so many other issues with the bathroom, including the layout, that it really does need to be gutted. It's hard to photograph that room because it's so narrow, but there is actually all this wasted space to the left of the tub that could be better utilized. (central hallway I mean, sometimes I write nonsense... typing too fast).